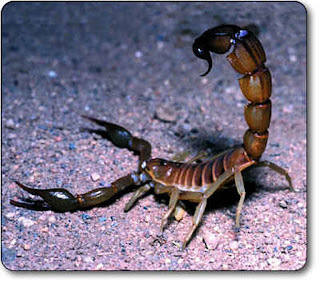 stylos: Watson: "The scorpion carries his poison in his tail, the slanderer carries poison in his tongue." Watson: "The scorpion carries his poison in his tail, the slanderer carries poison in his tongue." This [slandering our neighbor] is a sin against the ninth commandment. The scorpion carries his poison in his tail, the slanderer carries his poison in his tongue. Slandering ‘is to report things of others unjustly.’ They laid to my charge things that I knew not.’ Psa 35: 11. It is usual to bring in a Christian beheaded of his good name. They raised for a slander of Paul, that he preached ‘Men might do evil that good might come of it.’ ‘We be slanderously reported; and some affirm that we say, “Let us do evil, that good may come”.’ Rom 3: 8. Eminence is commonly blasted by slander. Holiness itself is no shield from slander. The lamb’s innocence will not preserve it from the wolf. Christ, the most innocent upon earth, was reported to be a friend of sinners. John the Baptist was a man of a holy and austere life, and yet they said of him, ‘He has a devil.’ Matt 11: 18. The Scripture calls slandering, smiting with the tongue. ‘Come, and let us smite him with the tongue.’ Jer 18: 18. You may smite another and never touch him. Majora sunt linguae vulnera quam gladii [The tongue inflicts greater wounds than the sword]. Augustine. The wounds of the tongue no physician can heal; and to pretend friendship to a man, and slander him, is most odious. Jerome says: ‘The Arian faction made a show of kindness; they kissed my hands, but slandered me, and sought my life.’ As it is a sin against this commandment to raise a false report of another, so it is to receive a false report before we have examined it. ‘Lord, who shall dwell in thy holy hill?’ Psa 15: 1. Quis ad coelum? ‘He that backbiteth not, nor taketh up a reproach against his neighbour;’ ver. 3. We must not only not raise a false report, but not take it up. He that raises a slander, carries the devil in his tongue; and he that receives it, carries the devil in his car. They are reproved who make no conscience of slandering others. ‘Thou fittest and slenderest thine own mother’s son.’ Psa 50: 20. ‘Report, say they, and we will report.’ Jer 20: 10. ‘This city (i.e. Jerusalem) is a rebellious city, and hurtful to kings and provinces.’ Ezra 4: 15. Paul was slandered as a mover of sedition, and the head of a faction. Acts 24: 5. The same word signifies both a slanderer and a devil. 1 Tim 3: 11. ‘Not slanderers;’ in the Greek, ‘not devils.’ Some think it is no great matter, to misrepresent and slander others; but it is to act the part of a devil. Clipping a man’s credit, to make it weigh lighter, is worse than clipping coin. The slanderer wounds three at once: he wounds him that is slandered; he wounds him to whom he reports the slander, by causing uncharitable thoughts to arise up in his mind against the party slandered; and he wounds his own soul, by reporting of another what is false. This is a great sin; and I wish I could say it is not common. You may kill a man in his name as well as in his person. Some are loath to take away their neighbour’s goods — conscience would fly in their face; but better take away their corn out of their field, their wares out of their shop, than take away their good name. This is a sin for which no reparation can be made; a blot in a man’s name, being like a blot on white paper, which will never be got out. Surely God will visit for this sin. If idle words shall be accounted for, shall not unjust slanders? The Lord will make inquisition one day, as well for names as for blood. Oh therefore take heed of this sin! Was it not a sin under the law to defame a virgin? Deut 22: 19. And is it not a greater sin to defame a saint, who is a member of Christ? The heathen, by the light of nature, abhorred the sin of slandering. Diogenes used to say, ‘Of all wild beasts, a slanderer is the worst.’ Antonius made a law, that, if a person could not prove the crime he reported another to be guilty of, he should be put to death.